I know I’ve mentioned Audra Kubat before. Every other Sunday Audra and Blair have been playing at the Buzz bar in Detroit doing a thing they call the Bittersweet Cafe. It’s pretty quiet this week with the World Series on, pretty much I was the first person here for the music. But since there really isn’t anyone else here she was working on this extended tune up / warm up and it was really nice to listen to and watch as a few other people have walked in. Nice and easy and casual and relaxing. So they do this show every few weeks and have a different guest play in the middle every time. They then “pass the hat” and chip in money for the guest and all the money collected goes to the guest (there is no cover to get in). 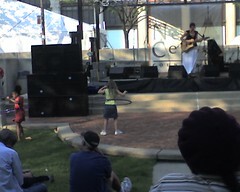 So it’s really nice down here, she’s on stage down by the only grassy area I’ve seen. The tastefest is nice, not too crowded but yet still a lot of people. And of course Audra is great! Remember a few months back when I mentioned Audra Kubat opened for Aimee Mann? Well she’s playing in Detroit at Tastefest. I’m not sure how that will be with her at a big public thing vs. the small earthy intimate setting but I’m going to go and find out! And did I mention it’s free? So Aimee Mann was in Ann Arbor tonight. It was in the Michigan Theater, I kept thinking Hill Auditorium and then I realized it was somewhere else. Obviously I figured it out, it was right around the corner, a really nice small venue and I was in the front row. It was a great seat, no one could even really be in front of you. I’ve been there before but I can’t remember for what (maybe something jazzy with Lou?). I got a Philly Steak sandwich and then a Long Island at the place that used to be Dooley’s. And the whole town appears to have WiFi (blogging and booze, now that’s just a bad idea). Aimee was great!!! She was excellent to listen to and interesting to watch. It was the last show of the tour so she kinda blamed the technical glitches on that. This would be the guitar (from hell) that wouldn’t tune, she thought it sounded so bad she stopped in the middle of the song and then apologized about a gazillion times. I didn’t get any pictures (that’ll come in Audra’s review) and he didn’t play some of her classics: Red Vines, Voices Carry and the 3rd one I had in my head when I started typing this sentence. Audra Kubat was the opening act. She was great too. I’m not even going to try to describe her, if I did it’d be some kind of quirky earthy tragic(?) poet chick, (that’s a compliment) and I think that’s what makes me like her. She’ll get a separate review later. http://GarySaid.com/tags/audra-kubat/ generated Friday, April 26th 2019 at 9:38:51 am EDT (in 93 queries in 0.669 seconds).